It’s a little difficult to describe the Sainsbury’s home brand packaging without being overly critical. It is almost as if the supermarket chain is saying: These are cheap Crisps and we don’t particularly care if you don’t like our packaging as long as you buy them. They are flavour colour coded, but there is no design effort at all. A crispy, brittle bite was quickly followed by almost instantaneous mashed potato. 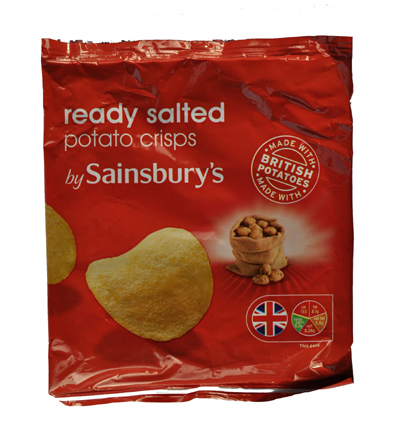 The soft crunch was not nearly as charismatic and appealing as some standard plain Crisps. If you were to draw a Crisp, it might look a little like these. They were nicely shaped, but flat. There were oil bubbles, but again, most were flat. The colour was a yellow sort of shade. There were skin covered edges. The only seasoning colouring visible were the oil soaked transparent areas. A Nose Plunge Test revealed little of the wonderful flavour that awaited us. Actually that isn’t entirely true, the flavour wasn’t particularly wonderful. There was a warm, fluffy potato flavour, but very little seasoning. Oily Potato would not sound quite as appealing on the packet though. However, there was a slightly salty after-taste.